Our suits are 100% worsted wool, which is a fabric that is cool in the summer and warm in the winter. You will feel the difference in quality the moment you try one on. A suit doesn't always have to be worn with a shirt and tie. If you are looking for a more casual or contemporary look, try layering a mock turtleneck with a sweater vest or light sweater for a great corporate casual look. At Charney's Men's Clothing Stores, our professionals will help you to create a look that represents you, no matter your size or your style. 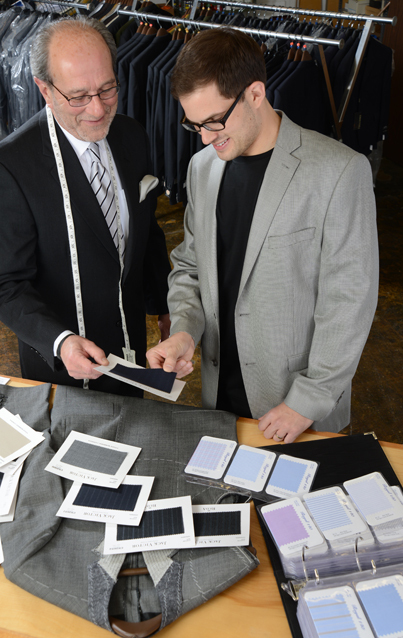 Most importantly, we will measure you and make sure your suit fits you the way it should. We carry suits in sizes 36 to 66 in Short, Regular, Long, Extra Long and Portly.